Home Trees and shrubs Centre and Top Bentham's Fan Palm Bottle-tree Butterfly Palm Calliandra Chinese Fan Palm Cocos Palm Cycas circinalis Fern-leaved Grevillea Fishtail Palm Foxtail Palm Ghost Gum Gum tree McDonnell Macrozamia Paperbark Tree Red beech River Pandanus Screw palm Shrubs Books about Australian trees The Australian Eukalyptus, or Gum, trees are mostly an interesting, scenic experience. As a European, I am used to see trees with dark barks, very few are light. So the German idea of a forrest is a dark, moist place. The Australian forrests are very light, even the rain forrest are still quite sunny. 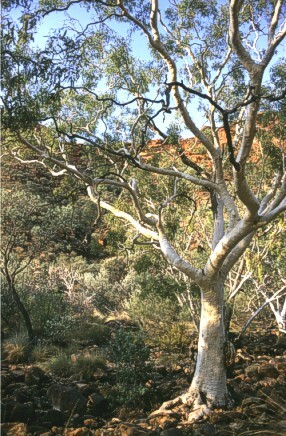 But the lightest, most friendly looking of all the trees I came across, is the Ghost Gum, named by it's ghostly bark colour. Together with the blue skies, red rocks and their own green leaves they will make pretty pictures under almost any circumstances. This one grows in Kings Canyon.